Modeled after the "Society Rooms" of the late 1600s and the Clapham Circle of the early 1800s, Q Society Rooms are designed to convene small groups of people to dialogue, learn, and work together helping you navigate the tensions of following Jesus in a post-Christian culture. A leader's DVD and a Participant's Guide for each group member will guide your group through five gatherings that conclude with your participation in a culture shaping project that puts your faith into action. In The Spirituality of Science: How Science Strengthens Faith in God, your group will explore the beleaguered relationship between science and faith. You'll learn how all Christians should be mindful and informed, rather than skeptical or even fearful, of science. 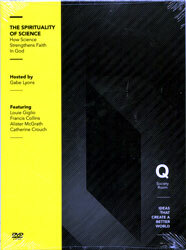 Two: Science and Faith at Odds?